Dads can be hard to shop for. It seems like I come back to the same ideas every year but really, how many ties or shirts can one person really need? 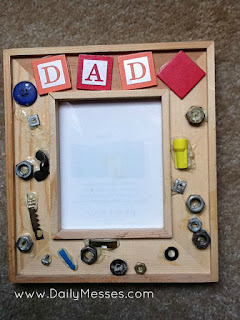 I made a list below with different ideas for Father's Day gifts. Hopefully, these may help you find a gift for the dad in your life. Make him a homemade card. Take the kids to kids workshop at Home Depot and make Dad a gift. Lowe's also used to offer these workshops, but I heard some stores were stopping, so please check with your local store. Plan a weekend get-away. Think Las Vegas, or somewhere unique and fun. There is a hotel called Sybaris that has pool suites! I haven't been there, but it looks awesome. An e-book reader. The Kindle is available at Amazon.com or is available in some stores like Staples. Barnes & Nobles also carries the Nook in their stores and online. If he already has a Nook, Kindle, or iPad, buy him a new case. Bake or buy a cake/cupcakes and let the kids decorate. Cuff links. These might seem boring, but you can make them fun with cool designs or getting ones made with parts from his favorite stadium! (Round cuff links: Wrigley Field, Yankee, Shea, Fenway. Square cuff links: Notre Dame, Ohio State. Home plate shaped: Yankee, Fenway, Ebbets Field, Shea, Wrigley Field. Football shaped: Notre Dame, Lambeau. These are just a few! For a link to the ones available on Amazon, click here. Patio ride. This is the link to the Denver Patio Ride, but they are available in a lot of cities. Google your city and "patio ride" or "peddle wagon". Concert tickets to his favorite comedian or band. Watch. My husband had a Citizen Eco-Drive that we bought over 10 years ago and he still loves it. It is powered y indoor light or sunlight. There are also other watches powered by movement. It saves on buying batteries, which is also good for the environment! Duck tour. This is the link to the Boston Duck Tours, but other cities have them as well. Google your city and "duck tour" or "duck boat tour". A photo collage of the family for his work. Paint a picture. Buy a canvas at the craft store and let the kids paint Dad a picture to sit in his office. We used Crayola Paint Brush Pens, which work really well for toddlers. Wash and clean out his car. Or a car wash gift certificate or gift set. Stuff for the office: a fan/heater, personal AC unit, radio/CD player, white noise machine. Stuff to fix the car. Season or single tickets to his favorite college or professional sports team. Lingerie. While you might be wearing it, I think he is probably enjoying it more. GPS. We always use our phone (love the Waze app), but my parents will not use their phone for directions. My mom will write or print out directions. She has been known on occasion to sometimes still use a map, so we got them a GPS one year. Coffee Camera Lens Mug for the photographer! It looks like a real camera lens! A frame to go with a family picture. My mother-in-law gave my husband a personalized wood frame that says Three Generations of T's. It has my husband, his dad, and out kids in the picture. There are a few options online (PersonalizationMall.com, Zulily, Wayfair). Dry fit/wicking collar shirts (polo shirts) for business casual. My husband loves these! Some brands are: Amazon, Nike, Adias, Columbia. Wallet. Hubby has the Big Skinny, which somehow ends of being thinner with the same amount of items in it. Gravity water collection system for the garden and/or water barrel. Garmin Golf GPS for the golf lover. Tools. My husband loves his Ryobi tools. They all run on the same rechargable battery, which makes it easy. American Ninja type rope obstacle course. Metal working or welding classes. Guided fishing tour, such as Inter-coastal fishing. Emergency jump-start for his car. Cookie basket delivered to his work. Cheryls.com has some cut tins and containers (golf ball, tool box, grill shaped). New tires. Upgrade his tires to run-flat tires! New suit: wet, snow, swim, business. Nerf gun. Hubby loves shoot, I mean play with, the kids. Fighter Pilot Experience. Aircombat.com and GreatAmericanDays.com offer several options. Train ride. TourVacationsToGo.com and Amtrack offer a variety of train rides. You may also be able to find a more old fashioned train ride by searching for "train ride" and your city or zip code. Glasses for their whiskey, scotch, etc. Hubby has these, and we love them! Treat him to a special haircut at a men's salon, such as Roosters. If he likes savory sweets, try Jelly Belly Draft Beef flavored jelly beans. Give a book from the kids: either one they make, or one like 33 Uses For A Dad. Take him to the shooting range. Break Out/Escape The Room challenge. Manly chocolate like Chocolate Chili Discs, Beef Jerky Chocolate Bar (Amazon used to carry, but I have seen jerky chocolate at some of my local stores), Insect Chocolate Bars, Chocolate dipped insects. iTunes, CD, Amazon Music Unlimited membership, Pandora membership. Bull ride, real or mechanical. Mechanical would probably be safer. Trip to stay in a tiny house. A tie or Tie Of The Month club membership. Make a mug! You can paint your own at pottery places, or find a kit at a craft store (have ones with special markers or labels for pictures). Air boat ride. We went on Airboat Rides at Midway in Florida several years ago and had a blast. Tickets to a sports game. Trip to swamp to go gator hunting, or you know, just a DVD of Swamp People. Chef coat with their name or initials embroidered. Take him to a race track (dog, horse, car). Something helpful: a cane if they are having problems walking, a sock assistant if they are having trouble bending to put socks on. We got one for my father-in-law when he was having hip problems. Personalized Pocket Watch, Key Chain Locket, etc. New grill and tools. Pay the extra charge and have the store put it together for him. That way it's ready for him to enjoy. Gift card to his favorite store. Amazon will ship a card to his house or send it to his email. Buy him a book or e-book. Boat ride. There are paddle boat rides, dinner cruises, tours, etc. There are even some of the old fashioned paddle boats that you can take overnight cruises!